Utkatasana is known by many other names, such as ‘fierce pose’, ‘fiery angle pose’, ‘powerful pose’, ‘lightening bolt pose’, ‘chair pose’, ‘hazardous pose’, ‘awkward pose’…. So you already know it’s not exactly a posture you’re going to fall asleep in…. While this posture is already pretty intense to begin with, the addition of a twist builds more heat in the body, and is also more demanding in terms of balance and breathing…. Twists actually help create more space for the lungs to expand, allowing the breath to become more full and deep, and as mentioned in a previous post, the effects of twists are often felt after we practice them. They open up the intercostal muscles which surround the ribcage, and also release tension in the diaphragm – our primary breathing muscle. Twists are also said to bring resilience to the spine, and as a lot of our day is now spent holding the back in a fixed and rigid position, twists offer a way to unravel stored tension in the muscles of the back. We know that the way we breathe effects every little part of us; physical, emotional and mental. Short, shallow breathing that resides high up in the chest mirrors the kind of breathing we would do when in a state of stress. This is an aspect of us that is a part of our primitive human reaction to stress; it’s a sign that the sympathetic nervous system is active, which causes the ‘stress response’, also known as the ‘fight or flight response’. This was indeed useful when we were in real danger – such as needing to run from a wild animal or fight to save our lives, as the increased respiratory rate and faster heart rate pumps more blood and oxygen around the body, and helps release glucose from various organs in order to provide energy for our muscles to jump into action for whatever is needed. So yes, this is all useful if we’re in that kind of situation, but when we’re activating our fight or flight response in every day situations that aren’t life threatening, we’re unnecessarily causing our body to become distressed all too often. We have the same mechanisms within us to deal with stress as animals do, yet we’re the only being who has learned to access this stress response just by thinking…. which means calming the mind isn’t just good for us mentally, it benefits the whole body. When we constantly tap into the sympathetic nervous system, our adrenal glands become fatigued, that glucose which is released isn’t used and becomes stored as sugar in the body, causing weight gain, and our long-term systems such as the reproductive system and digestive system are much less efficient (after all, who needs to have babies or digest food when there’s so much danger around?!)…. Having an awareness of how we breathe in our Yoga practice is an invaluable tool we can bring off the mat, helping us to become aware of how we breathe in everyday life – thus enabling us to calm ourselves when we’re in all kinds of situations, not just a challenging Yoga pose! Notice the way you’re breathing in this asana; the combination of twisting, balancing, and the position of the legs means the body is working quite hard to maintain the position, and if the breath is also strained, this will activate the sympathetic nervous system (the fight or flight system) in a big way. There are parts of our practice that can be very relaxing, soft, and totally comfortable…. but there’s also elements that are about finding comfort within discomfort, and there are valuable lessons to be learned from this. Of course, it’s very important to remember that if something doesn’t feel right, there’s no reason to do it, and we should never ever push through any sort of pain, but if it’s a case of “this is a bit challenging, I don’t really like it”, or “Wow, this is harder than I thought!” then as long as there’s no risk of injury, and you’re not in pain, it can be a very powerful way to overcome the mind’s tendency to slip into old habits, and move past self-imposed limitations about what we think we’re able to do. Instead of pushing deeper into a pose like this, think about softening into it – yes, even in a twisting posture named ‘fierce pose’…. Pushing the body means we’re kind of working against it rather than with it, and in a physical Yoga practice, the most important aspect is to respect the body with all of the parts we think are brilliant, and the parts we think are not-so-brilliant. Learning to build a positive relationship with the skin we’re in can be a difficult practice, since we seem to lean towards ‘feeling bad in order to feel good’ as Donna Farhi puts it in her brilliant ‘Breathing Book’ , but its one of the many layers that – if we can let go of – offers us the chance to experience life as much more than the ‘I’ we identify with, and we become limitless in our potential for personal growth. Start in a seated position, and move through a few lateral bends (side bending) and a gentle twist to each side of the body. From there, make your way onto all-fours and practice ‘thread the needle’ to open out the muscles of the back and shoulders. From there, come into adho mukha Svanasana (downward facing dog) and practice ‘twisted downward facing dog’ – which you’ll find here. Slowly walk your feet towards the front of the mat, and come into Tadasana, before moving through a few rounds of surya namaskar A and B to warm the body. Twists require a little prior space in the sides of the body, so lastly, practice reverse warrior and parsva konasana on each side of the body to get a sense of length in the space between the hip bones and ribs. Bring the feet together with the big toe joints touching, and a small gap between the heels. The positioning of the feet is taught in many different ways, but many people find this is more beneficial and healthier over time for the knees, ankles and hips. Shift the majority of the weight into the heels, which prevents the knees from taking as much force and allows the core to become more engaged. Ensure you can still see the toes over the edge of the knees to protect the ligaments at the front of the kneecap. Bring the palms together at the centre of the chest and inhale to create space across the collarbones and front of the shoulders. Your knees: Maintain the alignment of the knees being in line with each other as you twist, so that the action of the twist happens in the spine and doesn’t pull on the hips. *Although, if this causes pain, then work with your body and find a way of making it feel good! You might need to move the knees, or change something else to find YOUR asana. Your breath: Cultivate a smooth, calm and steady breath, and see if you can maintain this throughout the whole of the posture – the transition into it, the length of time you’re ‘in it’ for, and the transition out…. Watch the breath, it’s very interesting to note that if any wobbling occurs, or if the body becomes a little fatigued, the breath is likely to become shallow and strained, and this is likely to set off a chain reaction of stress hormones throughout the body. As you exhale, begin to twist to the [right], bringing the [left] elbow outside of the [right] knee. Notice if the chest begins to crumple and collapse, and focus on keeping the upper back and shoulders broad and open. Press the palms together and keep the elbows drawing away. 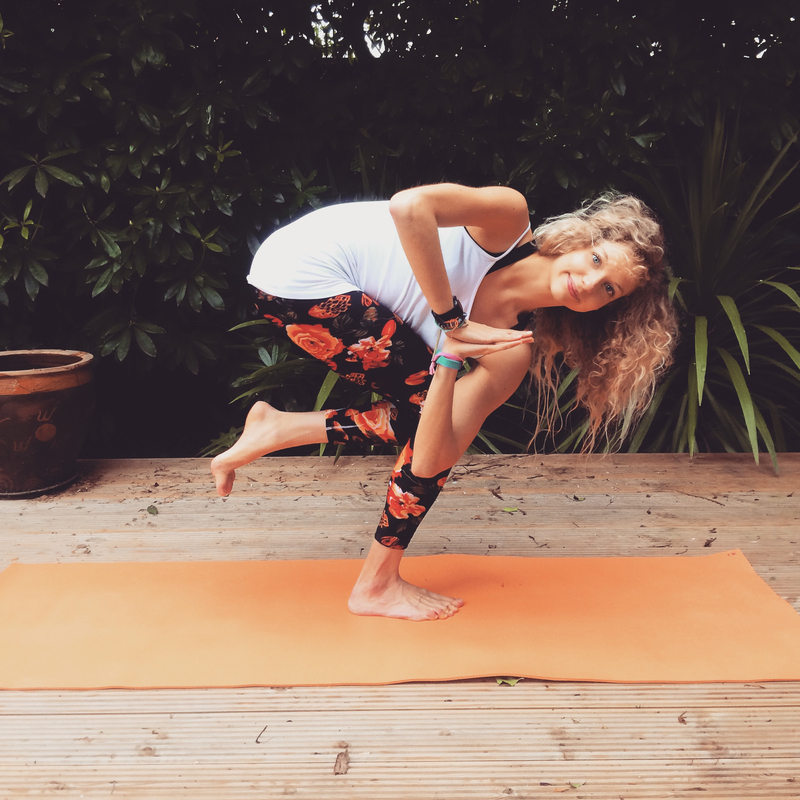 Sometimes known as ‘pelican pose’, the addition of lifting one foot away from the floor provides an extra challenge, but it’s especially important to realise whether this is a challenge your body is happy with right now. While the mind is likely to go in two directions here: “No I can’t”, or “Yes I can”, (although there’s also that wonderful part of us that sometimes says “I don’t know, but let’s see what happens if I have a go!”), the body will tell you whether it’s really worth adding in any variations right now. A clue would be to listen to the breath first – are you breathing calmly and smoothly, is the body steady? Then go ahead…. To transition out of the asana, again ground into the feet so you’re stable, and inhale to come back to the centre. Straighten the legs, release the arms by the side of the body and come back into Tadasana to observe the effects of the asana before practicing on the other side of the body. To counterpose the effects of this asana, make your way into adho mukha Svanasana (downward facing dog), and then lower down onto the floor to practice Baddha Konasana in order to open the inner thighs and relax the hips. Finish with a gentle chest opener or ‘seated heart opener’, which you’ll find in this post. The more we practice, the more we may realise that learning to maintain a calm breath and a calm mind in a difficult asana can help us to maintain a calm breath and a calm mind in a difficult life situation off the mat, and that is where the real practice happens….